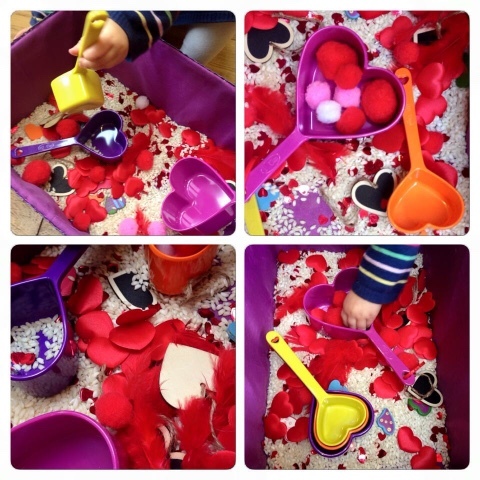 With Valentine's Day around the corner, I'm reminded of one of Culturetot's favourite themed sensory baskets: an extremely simple to produce love-themed mixture that has been resurrected for two years in the run. I found a set of heart-shaped measuring cups and threw in a base of Risotto rice and tiny pasta stars, foil and satin confetti, dried flower petals, feathers, wooden hearts and - the absolute winner - pom poms of various shapes and sizes. Culturetot really enjoyed scooping and pouring, sorting the items, collecting the pom poms and stacking the cups. All great for sensory awareness, fine motor development and colour matching practice. The last basket stayed around for months. 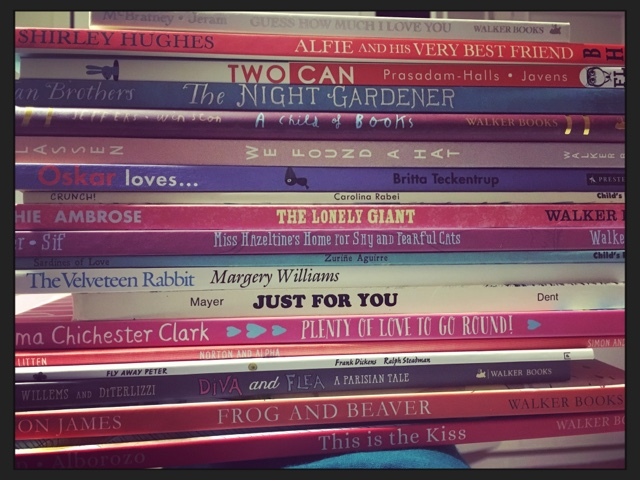 Over the last twelve months or so we've also read a host of brilliant new books on the theme of love and I've been saving them for a round-up like this. There are no traditional marry-a-prince tales in this selection. 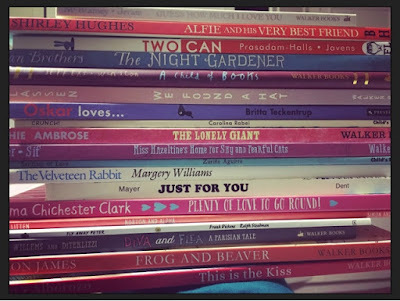 Rather, I've chosen a set of books that speak to our little ones in different ways about the nature of love - from friendship, to sacrifice, the journey of belonging, to a passion to improve the world for others. You'll find many others of this nature in one of our most popular posts Books to Change Children's Thinking. Here are a few more thought-provoking numbers both new and vintage. No list on love would be complete without the classic tale from McBratney and Jeram which coined that gorgeous phrase "I love you to the Moon and back" and to celebrate 20 years of Guess How Much I Love You there's a lovely shiny new hardback version just been released this Spring. It's a beautiful, simple little story about a small rabbit's endeavour to explain to his Daddy quite how much he adores him. Whether to the ends of his toes, as far as he can stretch, or even to the Moon, his Daddy's love is able to stretch even further. Next up, and first published in 1963, Fly Away Peter by Frank Dickens and Ralph Steadman has been republished for today's children by Pavilion. Jeffrey is a downhearted Giraffe; his neck is too short and he is unable to play with his peers. One day he stumbles across a kindred soul; a bird who cannot fly. Neither have friends and they find solace in each other's company. Through their friendship and care for each other, and a surprising game of hide and seek, they each find help and their hearts desire. "Weeks passed and the little rabbit grew very old and shabby, but the Boy loved him just as much. He loved him so hard that he loved all his whiskers off, and the pink lining to his ears turned grey, and his brown spots faded. He even began to lose his shape, and he scarcely looked like a rabbit any more, except to the Boy. To him he was always beautiful, and that was all that the little Rabbit cared about. He didn't mind how he looked to other people, because the nursery magic made him Real, and when you are Real shabbiness doesn't matter." Next a little classic from my childhood Just For You by Mercer Mayer, which I'm delighted to see is still available. 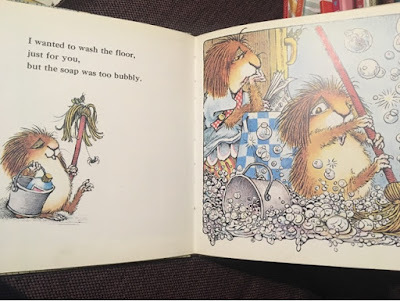 It's a hillarious tale of a little creature who wants desparately to show his mum how much he loves and wants to help her, but unfortunately everything he attempts goes wrong. "I wanted to not splash in my bath just for you... but there was a storm." 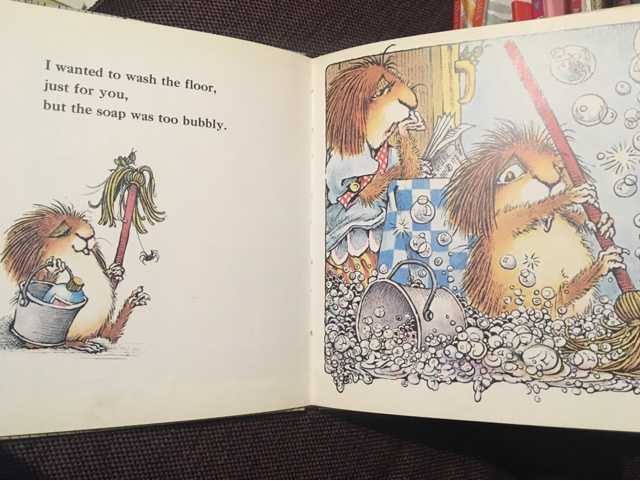 The pictures are fantastic, the troubles endearingly funny, and of course, as is the case for every little person trying to do their best, a moment of love and huge toddler effort erases anything that has gone before. Finally in the classics, a new offering from the eternally brilliant Shirley Hughes Alfie and His Very Best Friend. We've encountered Bernard many times before. Annie Rose likes him, he is funny and makes big art. He and Alfie are different - they don't always behave in the same way or like the same things, but they are best friends - and that's what matters. 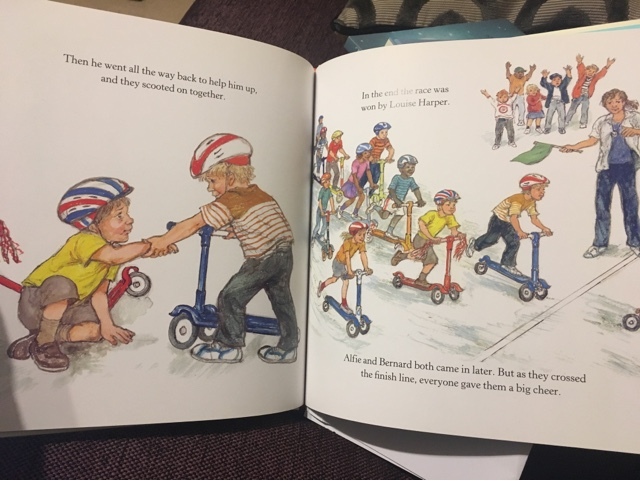 My favourite part of this lovely book features a scooter race for the under 5s. Alfie scooted as hard as he could, but Bernard who was excellent at scooting was much faster. Then disaster - Alfie skidded and fell off his scooter, hitting the ground with a big thud. Seeing what happened to his best friend, Bernard stopped, lost his lead and went to help his friend. In the end someone else won the race and Alfie and Bernard came in later, crossing the finishing line together. This image really reminded me of my Bernard. She is called Kate. We were both pretty hopeless at running and we had a fundamental objection to being forced to run the 3000 metres because nobody else wanted to do it. We jogged one lap, walked the next and linked arms to cross the finishing line together. She's still a best friend and I cannot think of one time she has ever let me down. "You are a true friend" Dad told Bernard when the race was over. If my little women can be friends to others like that, I'll be immensely proud, and I hope they too find their Bernards and their Kates. There are some great books around on sharing and the greater importance of having a friend than material possessions, and one of the most brilliant is We Found A Hat by Jon Klassen. In the simplest of tales, two tortoises discover a hat, but there is only one hat. It looks good on both of them, and they both want it. "But it would not be right if one of us had a hat and the other did not..." How will both parties deal with this difficult decision? Quirkily illustrated and extremely perceptive, this picture book teaches a crucial lesson to even the tiniest of readers. 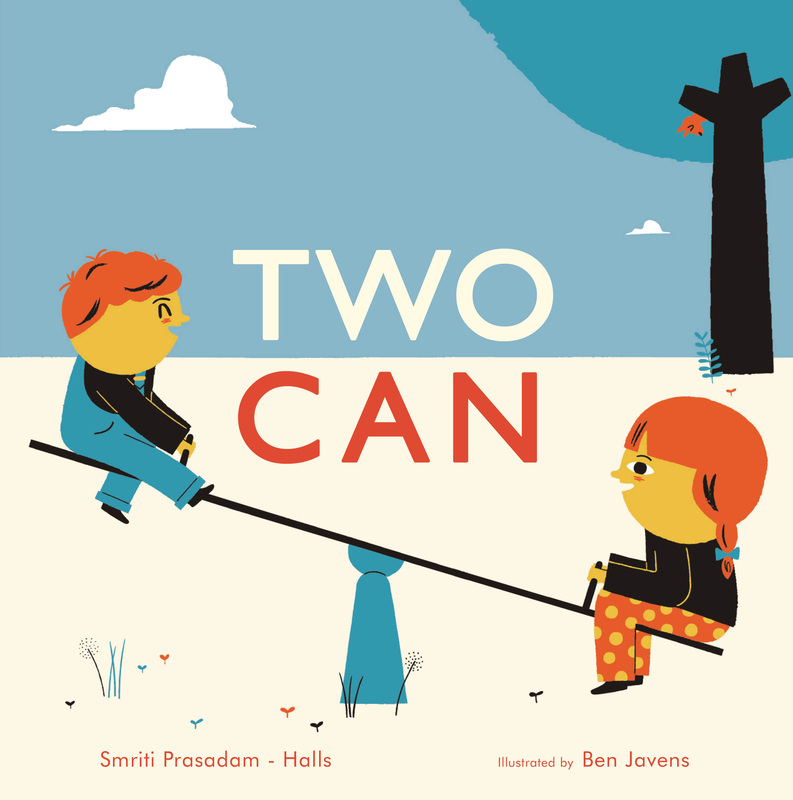 A couple of other great titles include the simple and effective Two Can by Smriti Prasdam-Halls and Ben Javens. Using only very few words and striking images, the book plays with the word 'can'. I can swing alone, you can't (too small). One can build a sandcastle, two perhaps cannot. But two are required to see-saw, two can be friends and two can encourage the other when they can't go it alone. It's a simple message for little people that playing together and sharing is much better than being alone. Two final, extremely cute additions to the sharing pile are Crunch by Carolina Rabei - a tale about a ravenous guinea pig who refuses to share his food with his new friend Cheddar at all costs. A hug in exchange for a morsel of food? You must be kidding! But then he turns his back and his friend disappears - Crunch pictures Cheddar starving and alone, and realises that he kept his food but lost a friend. He sets out to find his pal and learns the important lesson of how to say sorry. We love Emma Chichester Clark's gorgeous illustrations and the girls enjoyed her tale of rivalry between cat and dog Plenty of Love to Go Round. 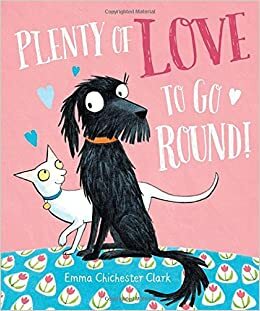 Perfect to share with siblings, or to prepare an older child for the arrival of a baby (see many more recommendations on this theme here) this story focusses on the message that a heart (and indeed cat basket) can expand to include those who may appear at first glance to be our rivals. Two lovely new reads on the theme of forgiveness are The Lonely Giant by Sophie Ambrose and Frog and Beaver by Simon James. A giant, keen on bashing, smashing and mashing the environment around him becomes sad and lonely when the forest an all its animals begin to recede and all becomes quiet and still. He remembers the beauty of birdsong, and one day sighting a little yellow bird, he captures and cages it - hoping it will sing for him. The bird grows sadder and sadder and can no longer sing until the giant sets her free, saying how sorry he is, and she flies away. He wonders what he can do to bring back the forest, the plants and the animals and sets to work mending all that he has broken; planting, sowing, mending mountains. Then he watched and waited and, after much patience, the forest bloomed again. His joy had returned, and with it, the little bird. Frog and Beaver are friends, but beaver is frankly too enthusiastic with his dam-building. He will take no advice and ruins the habitats of those around him, who are forced to move. Frog takes matters into this own hands and tries to convince his friend to listen - still no hope. Eventually Beaver's dam becomes so enormous it collapses; destroying homes and almost killing him. Frog saves his life and even the twice-displaced animals forgive him. The girls seem to love this story and it has a great environmental message too. 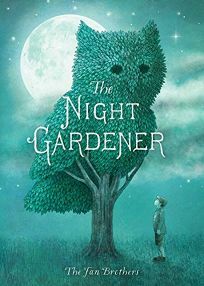 A stunning new book from the Fan Brothers The Night Gardener is the most stunningly illustrated we've seen this year. An old man and expert in topiary arrives in a dull village where everyone seems to be going through the motions. He sets to work transforming their environment and providing a focus for rejoicing. His stunning creations are closely observed by young orphan William, who discovers a real sense of wonder and excitment. Something was happening on Grimloch Lane. Something good. One night as William heads home, he stumbles across the night gardener at work and becomes his apprentice. And then day comes, the park is transformed, the gardener is gone - but he leaves a legacy - a young boy with a new passion and a set of shears. This stunning book speaks on so many levels, of the transformative effect of creativity and joy, the crucial legacy of stimulating a love for something in a new generation and how selfless and positive intervention will always leave the world a better place. Birgitta Sif is one of my favourite contemporary illustrators and here, her collaboration with Alicia Potter has resulted in a simply beautiful little book about the lovely Miss Hazeltine, who runs a home for timid moggies. Miss Hazeltine's Home for Shy and Fearful Cats is a gorgeous tale about the loyalty and love that can come from a relationship with someone who is truly patient and kind, and works with our flaws and fears; loving us through them. The loveliness of this picture book not only reminds us of this, but that often more importantly those we aim to save will ultimately save us in turn. Finally, a trio of simple books about love. Firstly one for the very young - This is the Kiss by Claire Harcup, is a simplest illutration of the beauty and joy of the love of a parent - from a wave to a cuddle to a snuggle a goodnight kiss. It is a great early bedtime book. 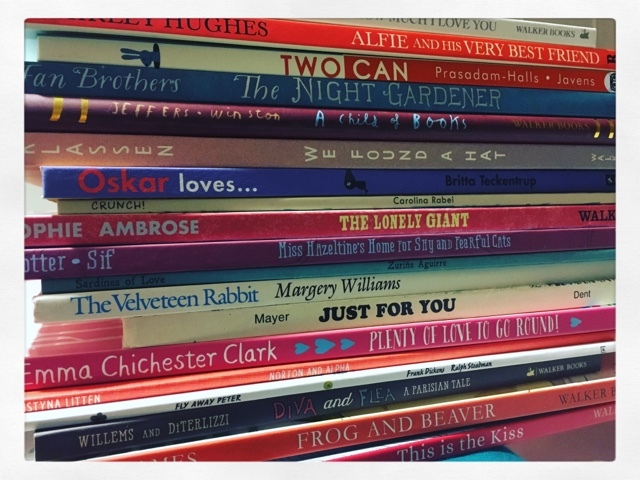 The second is one of our favourites from last year Oskar loves... by Britta Teckentrup. With beautiful lyrical language and description, and the loveliest of illustrations, adorable Oscar sets out what it is in life that he really loves. From the the smell of spring to sweet red cherries, losing himself in books to the silence of snow. And of course his favourite pebble, which Culturetot was delighted to receive the the post from Oscar and proudly displays on her fireplace. This book reminds us so effectively to stop and look around - and take delight in the beauty and simplicity of the world through the eyes of a child. Disclaimer: Many of the newer books were sent to us over time for the purposes of an honest review. I only select the books I particularly like. It' actually a great and helpful piece of information. I am glad that you shared this helpful information with us. Please stay us up to date like this. Thank you for sharing. I admire this article for the well-researched content and excellent wording. I got so involved in this material that I couldn’t stop reading. I am impressed with your work and skill. Thank you so much. Releases New Children's Book.